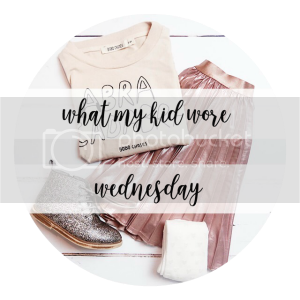 I've decided to link up with the What My Kid Wore Wednesday linky again this week so let's jump straight in. We got this t-shirt from La Redoute last year before we went on holiday. I love clothes like this - not too busy but still cute and trendy. And also monochrome - give me all the monochrome. I think we got these jeans from Next secondhand in size 9-12 months and they are huge on Elijah. He is quite small for his age at 18 months. And of course, we picked the same gorgeous blue shoes we featured last week from Purebaby. If you don't know of Purebaby, it is an Australian shop full of beautiful organic baby clothes. They have so many gorgeous things, I would definitely recommend checking them out. Aw I love that Happy top! I am a big fan of simple designs 🙂 So Cute! I think it came in a pack of three, one of the others has little clouds on it and is just as cute!